Welcome to Bracken Lodge Log Cabin. We hope your stay with us will be both pleasant and relaxing. Please make yourself at home and enjoy the beautiful scenery. Below are the house rules and some suggestions of things to do in the area we reccomend. The cabin is your responsibility for the duration of your stay. Any damage sustained should be reported as soon as possible to info@brackenlodgegrampians.com or to James 0409 441 107. WATER - The cabin is run off rainwater so please try to refrain from excessive water use. WIFI - We have a Satellite NBN internet connection at Bracken Lodge. Although it is a fast connection, data is limited on all Satellite plans - so please be mindful of excess usage. WASTE - Please take what you can with you. A small bin in the kitchen has been provided for food waste. Please bag this upon departure. Place all of your recycling in the bin provided outside by the back door. FIRES- Please only light campfires in the designated fire pit outside or in the fireplace inside. Do not leave any fires unattended. Please check the National Park Fire regulations before lighting at all times. Your furry family members are always welcome at bracken lodge Log cabin. For any future guests with possible pet allergies, please do not let your pet on the furniture or in the bedrooms. Please note: pets are not allowed in the national park. Hollow Mountain Walk, Mt Zero. We recommend stopping at Grampians Estate Cellar Door. Beaufort and Ararat have supermarkets on the highway for stocking up on Groceries, which are a better option than Halls Gap as it can be quite expensive. The kitchen has everything you need to cook and prepare food including a stovetop, oven and microwave. There is a coffee maker and a French press so bring ground beans. You can also cook outside on the barbecue (located in the shed) or if you're looking to get adventurous, on the fire pit hotplate. If you need any additional basics, pop up to the Happy Wanderer, about 5 minutes drive up the road. They supply basic goods and have a limited bottle shop. Let Janet know you are staying at bracken Lodge, she will look after you. The kangaroos usually come through the property on dusk and dawn. Grab a wine or a warm beverage and sit on the deck to watch. The sunset views from the front door are beautiful. In the morning they come quite close to the cabin so you can sometimes watch the baby joeys from the main bedroom. We also see Emus and deer frequently. Hollow Mountain walk - 1hr round trip. It’s about 10min drive north on C222, the turn towards Mt Zero. A great quick walk to an amazing view of the Northern Grampians. Its pretty steep and some parts of the walk are rocky but worth it when you get to the top. You have the amazing view of the olive plantations below. On your way back stop by the Grampians Olive Co. (Toscana). You can see how award winning organic olive oil is made and enjoy a tasting plate. They also have wood fired Pizza if you ask nicely. Pinnacle Trail (backwards) - About 4 hrs round trip. The Grampians staple, but still amazing. We recommend doing it back wards because you get the million steps out of the first then you walk against the traffic ( if any) on the way down. You start in the car park in Halls Gap, head up the steps to the pinnacle (the view) then work you way back down past silent street, cool chamber and grand canyon to finish with Venus baths. You loop around and end up in the car park in halls gap. Head south from Bracken Lodge on northern grampians road (C222) towards halls gap for about 10 minutes and park at Zumsteins car park. The track runs from the car park and its an easy walk (you could do it in thongs) and you end up at fish falls. You can swim here and jump into the water, its pretty deep in one spot. Take some snacks/drinks and chill there for a while if its warm. The water is fresh and beautiful. You have a few options in regards to walks and tracks here depending on what you want to do. From the Mackenzie falls car park you can walk to the lookout in 15 minutes easily. It's really worth it. The falls are beautiful and if you want you can follow the path further down and head all the way back to Fish falls at Zumstiens. There is a very basic shop at the Happy Wanderer Caravan Park 5 mins up the road. North on northern Grampians road (c222) It has the basics like beer, ice cream and pasta sauce. That's about it. There is also a house/restaurant called the Wanderer Inn which is a 50/50 bet of its open but when it is it's cute country food. They are also make their own ice cream. It’s about a 4 minute drive north on the main road. The Spirit of Punjab in Halls gap is actually pretty good Indian food. You can dine in or takeaway. The Live Fast café in the little boardwalk area of the main street is the best in the area. Pub fare - The Halls Gap Hotel is a great family bistro and public bar. 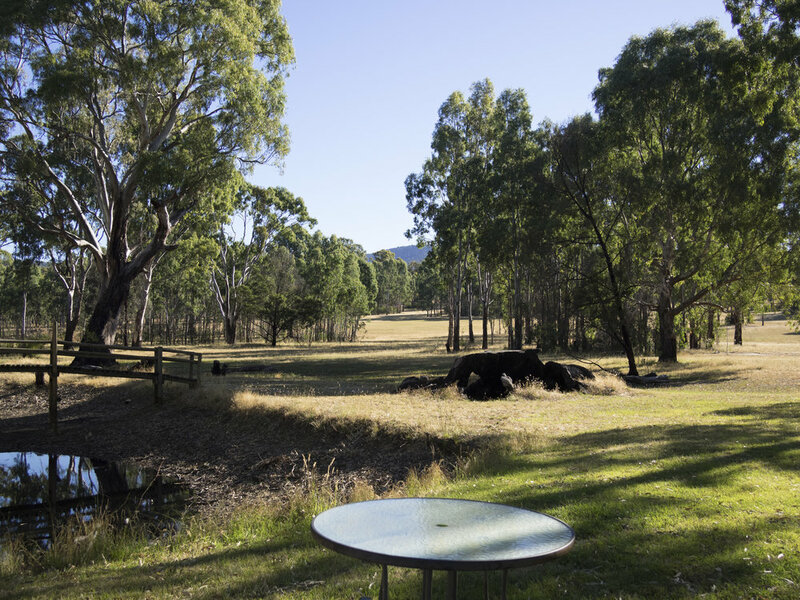 It has a large deck with views across the valley and you are guaranteed to see plenty of kangaroos. They have an outdoor area with a kids playground. Typical good quality pub food, parma's etc. Horsham is 35minutes away from Bracken Lodge. North on C222, then left towards Horsham. You can't miss it. Plenty of pubs, supermarkets, shops and quite a few agricultural equipment vendors. Nourish'd eatery is the best coffee in Horsham. You can also get a good green smoothie here if that's your jam. Grampians Estate Winery and Cellar Door Is on the western highway on the way up from Melbourne. (1477 Western Highway Great Western VIC.) They are known for their Sparkling Shiraz and Red Blends. A great place to stop try some wines, purchase a few for the weekend and enjoy. Halls Gap Estate Fallen Giants Vineyard - is a 40 minute drive south from Bracken Lodge. They have bbq facilities so BYO lunch and borrow a picnic rug. Barangaroo Wines - right next door to Norton Estate. Please feel free to let us know of any great hidden gems you may discover while you are enjoying the Grampians. Wishing you the best time and please let us know if you need anything.